It may be the best premise of a game ever: Squirrels who live in the tree of life against beavers who want to, presumably, eat it. The result being a real-time ‘squirrel’ strategy game (honest to God, the press release actually calls it that, brilliantly). The basics are simple enough to grasp. Your squirrels spawn in a castle on the left and move along a path to destroy the beaver’s castle on the right, while the beavers attempt to do the opposite. When the two armies meet in the middle they duel it out; the winner inching along the route until they encounter another unit. Things are spiced up by the variety of rodents available to the sides. Starting off with sword wielders, you soon get access to archers and flying kamikaze units. Spawning one of these is a matter of hitting the various icons as they load up on the bottom of the screen. Alongside these there are several spells that can swing a game for (or against) you. Fireball does some area of effect damage; ice freezes opponents for a few vital seconds, and the heart heals your squirrels. All of these are used by dragging the icons from the tray to where you want them on the map. Everything has a use, and while you will pound the unit icons as soon as they load, the spells require some thought, and it’s easy to see if you’re winning or not from the where the front-line is on the screen. Tree Wars doesn’t give you everything at once though, with various aspects delivered as you progress through the campaign. It keeps things fresh, and you know whatever new toy you get will be useful on the following level. In the levels themselves you’re still limited though. Starting with one or two different powers, normally a swordsman and a spell, you can unlock the rest by spending the golden acorns dropped by downed enemies – the first extra slot costing five, then ten, then fifteen and so on. The acorns can also be spent upgrading each power at the same increments. It’s an elegant system, requiring thought as to what you’ll need in the future, archers who can hit harder or an ice blast to manage an encroaching enemy. And managing you will have to do. 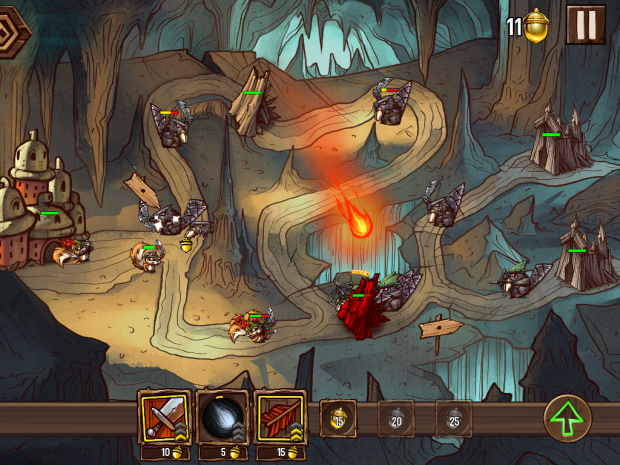 As you progress through the ten campaign levels, they become multiple path affairs, with different routes and numerous beaver castles to conquer. Dams also pop up, blocking certain routes until they are destroyed. The strategy just keeps layering on, balancing paths, resources, spawn times, and power choices. It speaks volumes about Tree Wars that a game that boils down to tapping icons as they load could be considered too hectic, yet it never does. Minutes will fly by and you’ll hardly notice. The campaign steadily gets harder as you progress, but with only ten levels you might worry about it being a little short, but each level has three difficulty settings, with each awarding a gem. These gems can be spent on permanent upgrades to your castle or troops, such as a stronger attack or faster spawns. It becomes almost impossible to progress without going back over earlier levels on a harder setting to get these upgrades, but the challenge is significant enough to keep it fresh. The gameplay itself is a joy to behold, with cute armoured squirrels facing off against pretty dark looking beavers, all on hand-drawn backgrounds. The animations are really smooth too, and the interlocking logo that caps each loading screen looks great. All in all it feels more polished than some AAA games. 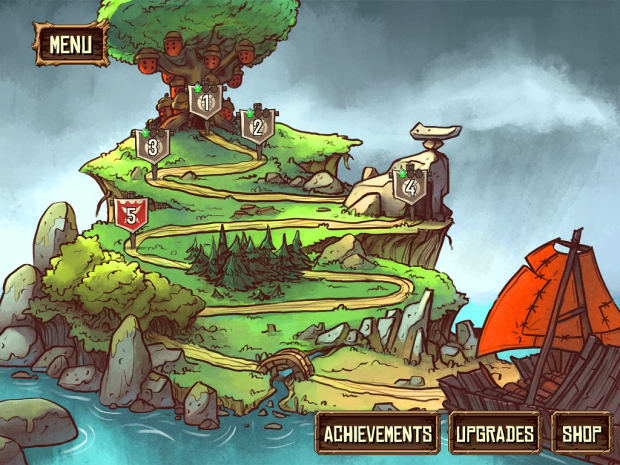 VERDICT: Tree Wars is a great looking strategy game with enough depth to keep you playing for hours. While the difficulty does rise considerably, it never feels unfair and actually gives a cause for replayability. If you’re a strategy fan and want a fix on the move, you can’t do much better.